"Reel to reel" redirects here. For other uses, see Reel to reel (disambiguation). A reel-to-reel tape recorder (Sony TC-630), typical of those which were once common audiophile objects. Note the distinctive Scotch tape spool at left. Reel-to-reel or open-reel audio tape recording is a form of magnetic tape audio recording in which the recording medium is held on a reel, rather than being securely contained within a cassette. In use, the supply reel or feed reel containing the tape is mounted on a spindle; the end of the tape is manually pulled out of the reel, threaded through mechanical guides and a tape head assembly, and attached by friction to the hub of a second, initially empty takeup reel. Reel-to-reel systems use tape that is 1⁄4, 1⁄2, 1, or 2 inches (6.35, 12.70, 25.40, or 50.80 mm) wide, which normally moves at 3 3⁄4 or 7 1⁄2 inches per second (9.5 or 19.1 cm/s). This compares to the narrower and slower compact cassette tape, which is 0.15 inches (3.8 mm) wide and moves at 1 7⁄8 inches per second (4.8 cm/s). By writing out the same audio signal across more tape, reel-to-reel systems offer much higher fidelity, at the cost of much larger tapes. In spite of the larger tapes, less convenient use, and generally higher cost media, reel-to-reel systems remained popular in audiophile settings into the 1980s. 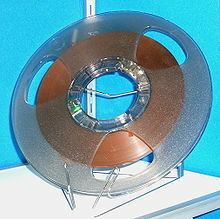 Reel-to-reel tape was also used in early tape drives for data storage on mainframe computers, video tape recorder (VTR) machines, and high quality analog audio recorders, which have been in use from the early 1940s up until the present. Studer, Stellavox and Denon still produced reel to reel tape recorders in the 1990s, but as of 2017[update], only Mechlabor continues to manufacture analog reel-to-reel recorders. Magnetophon from a German radio station in World War II. The reel-to-reel format was used in the earliest tape recorders, including the pioneering German-British Blattnerphone (1928) machines of the late 1920s which used steel tape, and the German Magnetophon machines of the 1930s. Originally, this format had no name, since all forms of magnetic tape recorders used it. The name arose only with the need to distinguish it from the several kinds of tape cartridges or cassettes such as the endless loop cartridge developed for radio station commercials and spot announcements in 1954, the full size cassette, developed by RCA in 1958 for home use, as well as the compact cassette developed by Philips in 1962, originally for dictation. 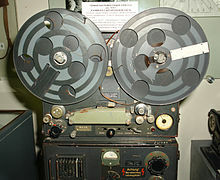 The earliest machines produced distortion during the recording process which German engineers significantly reduced during the Nazi Germany era by applying a "bias" signal to the tape. In 1939, one machine was found to make consistently better recordings than other ostensibly identical models, and when it was taken apart a minor flaw was noticed. It was introducing an AC signal to the tape[dubious – discuss], and this was quickly adapted to new models using a high-frequency AC bias that has remained a part of audio tape recording to this day. The quality was so greatly improved that recordings surpassed the quality of most radio transmitters, and such recordings were used by Adolf Hitler to make broadcasts that appeared to be live while he was safely away in another city. American audio engineer Jack Mullin was a member of the U.S. Army Signal Corps during World War II. His unit was assigned to investigate German radio and electronics activities, and in the course of his duties, a British Army counterpart mentioned the Magnetophons being used by the allied radio station in Bad Nauheim near Frankfurt. He acquired two Magnetophon recorders and 50 reels of I.G. Farben recording tape and shipped them home. Over the next two years, he worked to develop the machines for commercial use, hoping to interest the Hollywood film studios in using magnetic tape for movie soundtrack recording. Mullin gave a demonstration of his recorders at MGM Studios in Hollywood in 1947, which led to a meeting with Bing Crosby, who immediately saw the potential of Mullin's recorders to pre-record his radio shows. Crosby invested $50,000 in a local electronics company, Ampex, to enable Mullin to develop a commercial production model of the tape recorder. Using Mullin's tape recorders, and with Mullin as his chief engineer, Crosby became the first American performer to master commercial recordings on tape and the first to regularly pre-record his radio programs on the medium. Ampex and Mullin subsequently developed commercial stereo and multitrack audio recorders, based on the system invented by Ross Snyder of Ampex Corp. Les Paul had been given one of the first Ampex Model 200 tape decks by Crosby in 1948 and went on to use Ampex eight track "Sel Sync" machines for multitracking. Ampex went on to develop the first practical videotape recorders in the early 1950s to pre-record Crosby's TV shows. 7-inch reel of 1⁄4-inch-wide (6.4 mm) recording tape, typical of non-professional use in the 1950s–70s. Studios generally used 10​1⁄2 inch reels on PET film backings. Inexpensive reel-to-reel tape recorders were widely used for voice recording in the home and in schools before the Philips compact cassette, introduced in 1963, gradually took over. Cassettes eventually displaced reel-to-reel recorders for consumer use. However, the narrow tracks and slow recording speeds used in cassettes compromised fidelity. Columbia House carried pre-recorded reel-to-reel tapes from 1960 to 1984. Following the example set by Bing Crosby, high-speed reel-to-reel tape recorders rapidly became the main recording format used by audiophiles and professional recording studios until the late 1980s when digital audio recording techniques began to allow the use of other types of media (such as Digital Audio Tape (DAT) cassettes and hard disks). Even today, some artists of all genres prefer analog tape claiming it is "musical", "natural", despite its fidelity inaccuracies. Due to harmonic distortion, bass can thicken up, creating a fuller-sounding mix. In addition, high end can be slightly compressed, which some claim is more natural to the human ear, though this claim is more of a myth as it is not possible for natural sound to sound more natural as a compressed recording of it. It is uncommon, but sometimes artists record to digital and re-record the tracks to analog reels for this effect of "harmonically distorted" sound which to some, sounds pleasing. In addition to all of these attributes of tape, tape saturation is a unique form of distortion that many rock, blues and funk artists find very pleasing. However, with modern technology, these forms of distortion can be recreated digitally. The great advantage of tape for studios was twofold – it allowed a performance to be recorded without the 30-minute time limitation of a phonograph disc, and it permitted a recorded performance to be edited. For the first time, audio could be manipulated as a physical entity. Tape editing is performed simply by cutting the tape at the required point, and rejoining it to another section of tape using adhesive tape, or sometimes glue. This is called a splice. The splicing tape has to be very thin to avoid impeding the tape's motion, and the adhesive is carefully formulated to avoid leaving a sticky residue on the tape or deck. Usually, the cut is made at an angle across the tape so that any "click" or other noise introduced by the cut is spread across a few milliseconds of the recording. The use of reels to supply and collect the tape also made it very easy for editors to manually move the tape back and forth across the heads to find the exact point they wished to edit. Tape to be spliced was clamped in a special splicing block attached to the deck near the heads to hold the tape accurately while the edit was made. A skilled editor could make these edits very rapidly and accurately. A side effect of cutting the tape at an angle is that on stereo tapes the edit occurs on one channel a split-second before the other. Long, angled splices can also be used to create a perceptible dissolve from one sound to the next; periodic segments can induce rhythmic or pulsing effects. 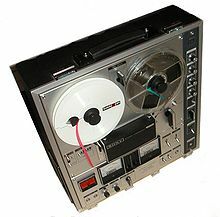 Professional-style tape reel designed to fit large NARTB hub. The performance of tape recording is greatly affected by the width of the tracks used to record a signal, and the speed of the tape. The wider and faster the better, but of course this uses more tape. These factors lead directly to improved frequency response, signal-to-noise ratio, and high-frequency distortion figures. Tape can accommodate multiple parallel tracks, allowing not just stereo recordings, but multi-track recordings too. This gives the producer of the final edit much greater flexibility, allowing a performance to be remixed long after the performance was originally recorded. This innovation was a great driving force behind the explosion of popular music in the late 1950s and 1960s. The first multi-tracking recorders had four tracks, then eight, then sixteen, twenty-four, and so on. It was also discovered that new effects were possible using multi-tracking recorders, such as phasing and flanging, delays and echo, so these innovations appeared on pop recordings shortly after multi-tracking recorders were introduced. A typical home reel-to-reel tape recorder, this one made by Sonora. It could play stereo quarter-track tapes, but record only in one quarter-track mono. Home equipment with missing features were fairly common in the 1950s and 1960s. For home use, simpler reel-to-reel recorders were available, and a number of track formats and tape speeds were standardised to permit interoperability and prerecorded music. Reel-to-reel tape editing also gained cult-status when many used this technique on hit-singles in the 1980s. The first prerecorded reel-to-reel tapes were introduced in the United States in 1949; the catalog contained fewer than ten titles with no popular artists. In 1952, EMI started selling pre-recorded tapes in Great Britain. The tapes were twin-sided and mono (2 tracks) and were duplicated in real time on modified EMI BTR2 recorders. RCA Victor joined the reel-to-reel business in 1954. In 1955, EMI released 2-track "stereosonic" tapes, although the catalog took longer to be published. Since these EMI tapes were much more expensive than a vinyl LP record, sales were poor; still, EMI released over 300 "stereosonic" titles. Then they introduced their Twin Packs, which contained the equivalent of two LP albums but playing at 3.75ips. The heyday of prerecorded reel tapes was the mid-1960s, but after the introduction of less complicated cassette tapes and 8-track tapes, the number of albums released on prerecorded reel tape dropped dramatically despite their superior sound quality. By the latter 1960s, their retail prices were considerably higher than competing formats, and musical genres were limited to those most likely to appeal to well-heeled audiophiles willing to contend with the cumbersome threading of open-reel tape. The introduction of the Dolby noise-reduction system narrowed the performance gap between cassettes and open-reel, and by 1973 prerecorded open-reel offerings had almost completely disappeared, even from record stores and audio equipment shops. Columbia House advertisements in 1978 showed that only one-third of new titles were available on reel-to-reel; they continued to offer a select number of new releases in the format until 1984. Heavenly by Johnny Mathis. Produced by Columbia Records (CQ 333). Circa 1959. Recorded for playback at 7.5 inches per second. Sales were very low and specialized during the 1980s. Audiophile reel tapes were made under license by Barclay-Crocker between 1977 and 1986. Licensors included Philips, Deutsche Grammophon, Argo, Vanguard, Musical Heritage Society and L'Oiseau Lyre. Barclay-Crocker tapes were all Dolby encoded and some titles were also available in the dbx format. The majority of the catalog contained classical recordings, with a few jazz and movie soundtrack albums. Barclay-Crocker tapes were duplicated on modified Ampex 440 machines at four times the playing speed, unlike popular reel tapes which were duplicated at 16 times the playback speed. All of the known pre-recorded reel-to-reels on the market are all documented at the Reel To Reel Index website which focuses on the last reels made during the 1980s and includes photographs of all of them. David Winter also released the complete list of 1950s EMI and Barclay-Crocker tapes. When Ampex broke apart in the 1990s, Quantegy Inc. was formed, later becoming Quantegy Recording Solutions in 2004. Quantegy (and formerly Ampex) led the field in reel-to-reel technology, and Quantegy was the only company left making reel-to-reel tape in the world for a period of two years. In 2007, Reel Deal Pro Audio purchased the majority of Quantegy's reel to reel audio tape and accessories and began to sell it on their website. In 2006, Recorded Media Group International (RMGI) in the Netherlands began manufacturing EMTEC specification tape in Oosterhout; at that time, it was then the only open reel tape manufacturer in the world. As of 2011, Pyral in France was making perforated 16 mm, 17.5 mm and 35 mm audio tape. In January 2012, Pyral SAS in France bought out the manufacturing equipment and intellectual property of RMGI with the intent to manufacture the tape in France. http://www.rmgi.eu/rmgi.asp?Id=25 The RMGI plant at Oosterhout was closed in April 2012. In 2015, MULANN acquired Pyral activities and is now offering a complete range of reel-to-reel audio tapes under the new brand RecordingTheMasters. MULANN also carry the torch and continue offering perforated audio tapes. ATR Magnetics LLC began manufacturing analog open reel tape in 2006 and is now in full production of all sizes of professional open reel recording tape. Jai Electronic Industries in India are currently making audio tape in 1⁄4-inch (6.35 mm) and 1⁄2-inch (12.70 mm) width, and perforated 16 mm and 35 mm audio tape for the film industry. In general, the faster the speed, the better the reproduction quality. In addition, higher tape speeds spread the signal longitudinally over more tape area, reducing the effects of dropouts that can be audible from the medium. Slower tape speeds conserve tape and are useful in applications where sound quality is not critical. 15⁄16 inch per second (2.38 cm/s): used for very long-duration recordings (e.g. recording a radio station's entire output in case of complaints, aka "logging"). 1 7⁄8 in/s (4.76 cm/s): usually the slowest domestic speed, best for long duration speech recordings. Compact Tape Cassettes typically operate at this speed. 3 3⁄4 in/s (9.53 cm/s): common domestic speed, used on most single-speed domestic machines, reasonable quality for speech and off-air radio recordings. 7 1⁄2 in/s (19.05 cm/s): highest domestic speed, also slowest professional; used by most radio stations for "dubs", copies of commercial announcements. Through the early to mid 1990s, many stations could not handle 15 IPS. 15 in/s (38.1 cm/s): professional music recording and radio programming. 30 in/s (76.2 cm/s): used where the best possible treble response and lowest noise-floor are demanded, though bass response might suffer. Speed units of inches per second or in/s are also abbreviated IPS. ​3 3⁄4 in/s and ​7 1⁄2 in/s are the speeds that were used for (the vast majority of) consumer market releases of commercial recordings on reel-to-reel tape. ​3 3⁄4 in/s is also the speed used in 8-track cartridges. ​1 7⁄8 in/s is also the speed used in Compact cassettes. In some early prototype linear video tape recording systems developed in the early 1950s from companies such as Bing Crosby Enterprises, RCA, and the BBC's VERA, the tape speed was extremely high, over 200 in/s (510 cm/s), to adequately capture the large amount of image information. The need for a high linear tape speed was made unnecessary with the introduction of the now-obsolete professional Quadruplex system from 1956, which segmented the fields of a television image by recording (and reproducing) several tracks at a high-speed across the width of the tape per field of video by way of a spinning headwheel with 4 separate video heads mounted on its edge (a technique called transverse scanning), allowing for the linear tape speed to be much slower. Transverse scanning was superseded by the later technology of helical scanning, which could record one whole field of video per helically-recorded track, recorded at an angle across the width of the tape. Even though a recording on tape may have been made at studio quality, tape speed was the limiting factor, much like bit rate is today. Decreasing the speed of analog audio tape causes a uniform decrease in the linearity of the frequency response, increased background noise (hiss), more noticeable dropouts where there are flaws in the magnetic tape, and shifting of the (Gaussian) background noise spectrum toward lower frequencies (where it sounds more "granular",) regardless of the audio content. An MP3 of a noisy rock band at a low bit rate will have many more artifacts than a simple flute solo at the same bit rate, whereas either on low-speed tape will have the same uniform background noise profile and high frequency saturation (weakened high end response). A recording on magnetic audio tape is linear; unlike today's digital audio, not only was jumping from spot to spot to edit time consuming, editing was destructive—unless the recording was duplicated before edit, normally taking the same amount of time to copy, in order to preserve 75-90 percent of the quality of the original. Editing was done either with a razor blade—by physically cutting and splicing the tape on a metal splicing block, in a manner similar to motion picture film editing—or electronically by dubbing segments onto an edit tape. The former method preserved the full quality of the recording but not the intact original; the latter incurred the same quality loss involved in dubbing a complete copy of the source tape, but preserved the original. Tape formulation affects the retention of the magnetic signal, especially high frequencies, the frequency linearity of the tape, the S/N ratio, print-through, optimum AC bias level (which must be set by a technician aligning the machine to match the tape type used, or more crudely set with a switch to approximate the optimum setting.) Tape formulation varies between different tape types (ferric oxide [Fe2O3], chromium dioxide [CrO2], etc.) and also in the precise composition of a specific brand and batch of tape. (Studios therefore generally align their machines for one brand and model number of tape and use only that brand and model.) Backing material type and thickness affect the tensile strength and elasticity of the tape, which affect wow-and-flutter and tape stretch; stretched tape will have a pitch error, possibly fluctuating. Backing thickness also affects print-through, the phenomenon of adjacent layers of tape wound on a reel picking up weak copies of the magnetic signal from each other. Print-through on analog tape causes unintended pre- and post-echoes on playback, and is generally not fully reversible once it has occurred. In professional half-track use, post-echo is considered less problematic than pre-echo (as the echo is largely masked by the signal itself) and therefore tapes stored for long periods are kept "tails-out", where the tape must be first wound "backwards" onto the take-up spool before playback. Another quality aspect, not related to audio quality, is the backing material. Typically acetate was used for cheaper tape, and Mylar for more expensive tape. Acetate would tend to break under conditions that Mylar would survive, though possibly stretch. The quality of the oxide's binder was also important, for it was common with old tape for the backing to wind on the reel, while the oxide falls off. Electronic noise reduction techniques were also developed to increase the signal-to-noise ratio and dynamic range of analog sound recordings. Dolby noise reduction includes a suite of standards (designated A, B, C, S and SR) for both professional and consumer recording. The Dolby systems use frequency dependent compression/expansion (companding) during the recording/playback, respectively. Initially, Dolby was offered via a stand-alone box that would go between a recorder and amplifier. Later audio devices often included Dolby. DBX is another noise reduction system that uses a more aggressive companding technique to improve both dynamic range and noise level. However, DBX recordings do not sound acceptable when played on non-DBX equipment. In the late 1970s there was also the German Telefunken-made High Com NR system, a broadband compander, which was technically very advanced. That was a gain in dynamics of roughly 25 dB that outperformed the well-known Dolby B by far. High Com was included in more sophisticated cassette recorders, mostly alongside the various Dolby systems. Even though this applied to the consumer market, there was no tape hiss at all that an ear could realize. Another advantage was that recorded tapes could be exchanged amongst High Com recorders without any loss of quality in sound. The "pumping effect" mostly reported from critical sound material (e.g. drums or any percussive instrument) with advanced dbx NR did not show in properly calibrated High Com recordings. It did not penetrate the market, possibly due to the less aggressive marketing strategies typical for German companies at that time compared to the widely known Dolby systems. Dolby B eventually became the most popular system for Compact Cassette noise reduction. Today Dolby SR is in widespread use for professional analog tape recording. As studio audio production progressed and became more and more advanced, it became desirable to record the individual instruments and human voices separately and mix them down to one, two, or more speaker channels later, rather than in real time in the studio before recording. In addition to allowing recording engineers and producers to experiment with different mixing arrangements, effects, etc. on the same performance and to produce multiple versions of a recording (without having multiple duplicates of all the studio control room equipment used for mixing), multi-tracking enables the use of non-real-time effects or effects that cannot be produced in the same studio where the musicians perform. Reel-to-reel recorders with eight, sixteen, twenty four, and even thirty two tracks were eventually built, with as many heads recording synchronized parallel linear tracks. Some of these machines were larger than a laundry washing machine and used tape as wide as 2 inches (51 mm). A single new reel of 1" or wider tape, could easily cost $100 to $200. Still, in professional studios, most tapes were recorded only once, and all recording was on new tape, to ensure the maximum quality, as studio time and the time of skilled musicians was much higher than the cost of tape, making it not worth the risk of a recording being lost or degraded due to using media that had been previously recorded upon. If more than 24 tracks of recording were required, it was possible in the 1980s and onwards with advanced machines, to synchronise two (or more) 24-track recorders to such precision that they behaved as a single 48-track recorder. Such precise synchronisation was achieved by recording a time code on one of the tracks on each reel of tape: a computer system would keep the two time codes perfectly synchronised, and transparently as seen by the machine operator. As professional audio evolved from analog magnetic tape to digital media, engineers adapted magnetic tape technology to digital recording, producing digital reel-to-reel magnetic tape machines. Before large hard disks became economical enough to make hard disk recorders viable, studio digital recording meant recording on digital tape. Mitsubishi's ProDigi and Sony's Digital Audio Stationary Head (DASH) were the primary digital reel-to-reel formats in use in recording studios from the early 1980s through the mid-1990s. Nagra introduced digital reel-to-reel tape recorders for use in film sound recording. Digital reel-to-reel tape eliminated all the traditional quality limitations of analog tape, including background noise (hiss), high frequency roll-off, wow and flutter, pitch error, nonlinearity, print-through, and degeneration with copying, but the tape media was even more expensive than professional analog open reel tape, and the linear nature of tape still placed restrictions on access, and winding time to find a particular spot was still a significant drawback. Also, while the quality of digital tape did not progressively degrade with use of the tape, the physical sliding of the tape over the heads and guides meant that the tape still did wear, and eventually that wear would lead to digital errors and permanent loss of quality if the tape was not copied before reaching that point. Still, digital reel-to-reel tape represented a significant advance in audio recording technology, and most who could afford to record using digital tape generally did.3M's 32-track recorder was priced at $115,000. 1978. Best known for its lines of tape media and professional analog recorders, with its M series of multitrack and 2-track machines, the Mincom division of 3M spent several years developing a digital recording system, including two years of joint research with the BBC. The result was the 3M Digital Audio Mastering System, which consisted of a 32-track deck (16-bit, 50 kHz audio) running 1-inch tape and a 4-track, 1/2-inch mastering recorder. The extremely short wavelengths recorded by a digital tape recorded meant that tape and tape transport cleanliness was an important issue. Specks of dust or dirt were large enough in relation to the signal wavelengths that contamination by such dirt could render a recording unplayable. Advanced digital error correction systems - without which the system would have been unworkable - still failed to cope with poorly maintained tape or recorders, and for this reason a number of tapes made in the early years of digital reel-to-reel recorders are now useless. 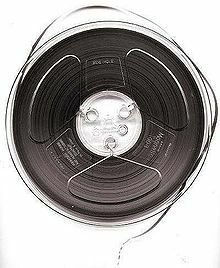 Early reel-to-reel users realized that segments of tape could be spliced together and otherwise manipulated by adjusting playback speed or direction of a given recording. In the same way as modern keyboards allow sampling and playback at different speeds, a reel-to-reel could accomplish similar feats in the hands of a talented user. Ross Bagdasarian, aka David Seville, recorded his voice at one-half normal speed, raising its pitch a full octave when played back at normal speed, to create the early rock and roll novelty song Witch Doctor. He later used the same technique, plus overdubbing his voice three times, to create Alvin and the Chipmunks. Numerous other creators of novelty, comedy, and children's records, such as Sheb Wooley, Sascha Burland, and Ray Stevens have since used this process. The mellotron is an electro-mechanical, polyphonic tape replay keyboard that used a bank of parallel linear magnetic audio tape strips. Playback heads underneath each key enable the playing of pre-recorded sounds. Each of the tape strips has a playing time of approximately eight seconds, after which the tape comes to a dead stop and rewinds to the start position. The title track of Jimi Hendrix's album Are You Experienced, on which the guitar solo and much of the drum track was recorded, then played backwards on a reel-to-reel. The Beatles recorded many songs using reel to reel tape as a part of the creative process. Examples include "Being for the Benefit of Mr. Kite" and "Yellow Submarine" which used a technique where stock recordings were cut up and then randomly reassembled and overdubbed on to the songs (recordings of calliope organs on "Mr. Kite", and recordings of marching bands on "Yellow Submarine"). On "Tomorrow Never Knows" multiple tape machines were used all interconnected patching tape loops that had been prepared by the band. The loops were played in a variety of ways such as backwards, sped up and slowed down. To record the song, the machines, which were located in separate studio rooms, were all manned by individual technicians and played at once to record on the fly. "Strawberry Fields Forever" combined two different taped versions of the song. The versions were independently altered in speed to end up together miraculously both on pitch and tempo. "I Am the Walrus" used a radio tuner patched into the sound console to layer random live broadcast over an existing taped track. "Revolution 9" also had many effects produced using a reel-to-reel and tape editing techniques. The BBC Radiophonic Workshop, notably Delia Derbyshire who "performed" (a more accurate term would be "realised") the original theme tune to the BBC series Doctor Who, by recording various sounds including oscillators and then manually cutting together each individual note on a group of reel-to-reels. The blues guitarist Claudio Gabis faced with the need to amplify his electric guitar, he used a homemade monochrome Geloso recorder, which he used as a distorter for his debut album Manal of 1970. This was achieved by injecting a signal and letting it "record under vacuum" (without tape, recording infinitely), an amplified signal could be obtained, and considerably increasing the volume could be distorted. Also in the first single of the group "Qué pena me das", has abrupt endings with tapes passed upside down. Aaron Dilloway, founding member of Wolf Eyes, often utilizes a reel to reel tape machine in his solo performances. Yamantaka Eye of the band Boredoms uses a reel-to-reel tape as an instrument in live performances and in post-production (a good example would be in the track "Super You" from the album Super æ). Mission of Burma, whose fourth member Martin Swope "played" a reel-to-reel tape recorder live, either playing previously recorded samples at certain times or recording part of the band's performance and playing it back either in reverse or at different speeds. When the band re-formed in 2002, audio engineer Bob Weston took over Swope's role at the tape deck. Pink Floyd's cash register introduction to their track "Money" was made using a loop of "splices" which was looped around a mic stand and through a tape player. Steve Tibbetts is a recording artist who includes tape editing as a significant portion of the creative process. Frank Zappa's Lumpy Gravy , We're Only In It For the Money and Uncle Meat, each featured edits too numerous to mention, in addition to multiple instances of speed alteration and intricately layered samples upon samples. The improviser Jerome Noetinger uses a ReVox A77 reel-to-reel to create and manipulate tape loops in live performance. In addition, multiple reel-to-reel machines used in tandem can also be used to create echo and delay effects. The Frippertronics configuration used by Brian Eno and Robert Fripp on numerous of their 1970s and '80s recordings illustrates these possibilities. ^ "STM Studiotechnic". Stm.hu. Retrieved 2014-01-07. ^ "The Tape Project". www.tapeproject.com. ^ "Analogue Audio Association - Home". www.aaanalog.de. ^ "Reel Deal Offers Last Quantegy Tapes". ProSound news. 2007-08-31. Archived from the original on 2011-01-02. Retrieved 2011-01-08. ^ "Perforated Tapes". Pyral. Archived from the original on 2011-07-21. Retrieved 2011-01-08. ^ "Discontinued Products – RMGI International". www.rmgi.eu. ^ "RecordingTheMasters – Professional Analog Audio Tapes". RecordingTheMasters. ^ "JAI ELECTRONIC INDUSTRIES PVT. LTD., Manufacturer, Exporter, India, Mumbai". Tradeget.com. Archived from the original on 2008-07-25. Retrieved 2014-01-07. ^ Jack Endino. "Response Curves of Analog Recorders". Endino.com. Retrieved 2014-01-07. ^ Las biografías más salvajes del rock Rolling Stone (Argentina), (in Spanish). Consultado el 9 de abril de 2014. ^ Informe especial Manal Dos Potencias (in Spanish). ^ "Pink Floyd : Money in Studio VERY RARE!!". YouTube. 2010-08-03. Retrieved 2013-10-25. ^ "Supercolor Palunar". Lionelpalun.com. Retrieved 2013-10-25. ^ In particular, the back cover of Eno's 1975 album Discreet Music provides a technical diagram of the dual reel-to-reel setup and other components used in recording the selections on that album. ^ "'Reporter' tape recorder, 1953". Science Museum, London. 2007-01-16. Archived from the original on 2014-11-03. Retrieved 2014-01-07.